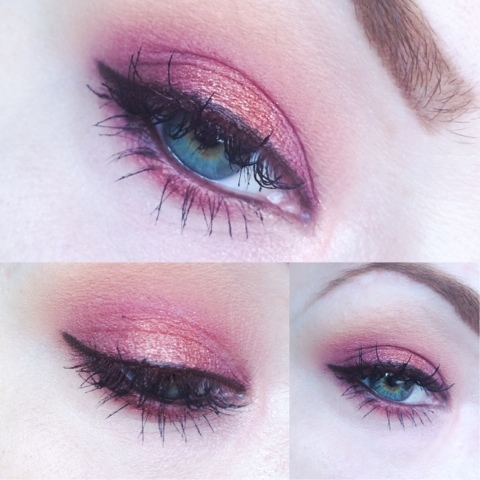 Lou Loves Beauty: Autumn Eyes. This is a simple and easy way of adding colour into any make up look and to transition into the Autumn season. The shades I've gone of today are purple with a pop of copper sparkle in the centre. 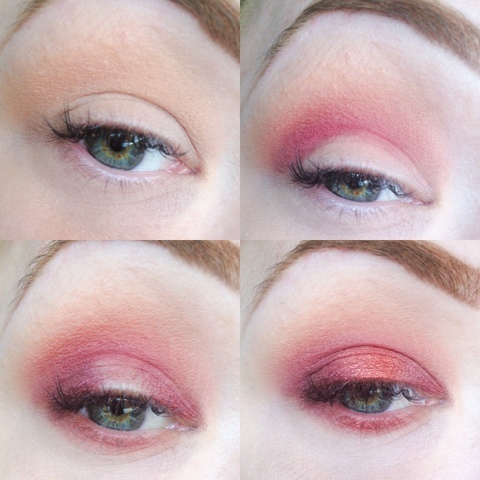 By placing this warmer shade in the centre makes the look a lot more wearable and everyday, as purple can be a little hard to carry off - you don't wan to look like you have a bruised or black eye now do you? In the crease place a transistion shade so the colours blend out smoothly. I used 'Peach Smoothie' from Makeup Geek, but any warm toned neutral shade will do, on a fluffy blending brush. Next, sweep your purple shade into the crease and socket line. I used Nars 'Seduction' Blush as I didn't have any purple shades. To fill in the outer and inner corners I used Mac 'Cranberry' a rich reddy purple shade with a hint shimmer. Make sure to leave the centre of the eyelid free of shadow as this is where your copper will go. I also blended this under the eye from outer to inner corner. I used Mac pigment in 'Copper Sparkle' on a flat brush and patted it onto the lid, and also placed it under the eye in the centre to mimic the colours on the lid. To finish off the look line your upper and lower water line and create a winged liner on the lid, followed with plenty of mascara on the top and bottom lashes, and even add some falsies if you want to? What eye shadows are you sporting this Autumn? This look is gorgeous! I've never been able to pull off a coppery/burgundy eye look. Maybe because of my eye colour?? This looks gorgeous on you none-the-less! Love the look you created, so gorgeous!